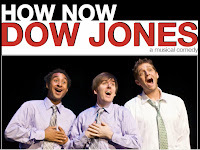 One of the FringeNYC shows enjoyed the most was How Now, Dow Jones, produced by UNSUNGMUSICALSCO.INC. There was nothing about it that put in on the "fringe" of theatre, except for maybe the fact that it was a revival of a Broadway show that didn't do very well in 1967. I can imagine why it didn't do very well - it has a corny plot and jaunty music, in a time when musical theatre of the late 60s was beginning to change to be less big Broadway show and more theatrical and serious. It's about an engaged couple who both work in the financial district. He's stalling until the Dow Jones average hits 1,000. She happens to be the "voice" of the Dow Jones. Frustrated and depressed, she meets a charming young man who's equally frustrated and depressed. They hook up - whoops, she becomes pregnant. In order to force her fiance into expediting their marriage, she falsely announces that the Dow Jones has hit 1,000. Alas, chaos. But the real father saves the day leads the way - thank goodness because the finale was so fun that the audience couldn't help but clap along! It wasn't hard to have fun - the show was terrifically revised and directed by Ben West. Ben has rightfully been honored with an Overall Excellence Award for Direction by this year's FringeNYC. Rommy Sandhu provided the classic choreography, including a very well excuted dance break by "Dow" (Shane Bland) and "Jones" (Dennis O'Bannion), and complete with the original choreography employed in Step to the Rear. Fred Berman , as the brilliant young magnate "Wingate", was absolutely delightful. The rest of the cast - Cori Silberman, Elon Rutberg, Shane Bland, Dennis O'Bannion, and Jim Middleton - delivered just fine, easily lending to the fun. Even as a revival, some songs cut from the original were restored, the story updated a bit (an hilarious joke about Lehman Brothers wasn't lost on me) and it was cut down from the original running time. Although I'm not sure it belongs in Fringe, it was still better than some shows I've seen at Musicals Tonight, Musicals in Mufti and even a few at Encores!, especially since they were completely off-book. Ben West is also the Artistic Director of UNSUNGMUSICALSCO.INC, a "production company dedicated to the preservation of musical theatre through the presentation of infrequently performed works." Current projects in development include new versions of Platinum, Lend an Ear and Rock 'N' Roll! The First 5,000 Years.